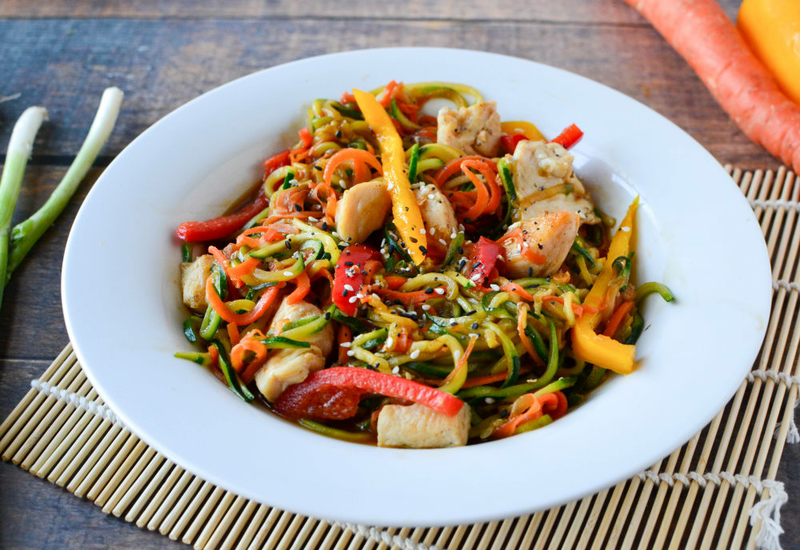 This stir-fry recipe with chicken and spiralized zucchini and carrots is a quick and easy way to enjoy healthy, delicious vegetables with a savory, Asian-inspired sauce. Vegetarian? Omit chicken and add tofu. Per Serving: 201 calories; 10g fat; 16.5g carbohydrates; 15g protein; 26mg cholesterol; 759mg sodium. So delicious! Much better than I expected, being that it uses spiraled veggies. The carrot was a little awkward to spiraling, but I made it work. This is a new favorite, I'm so glad I tried it out. 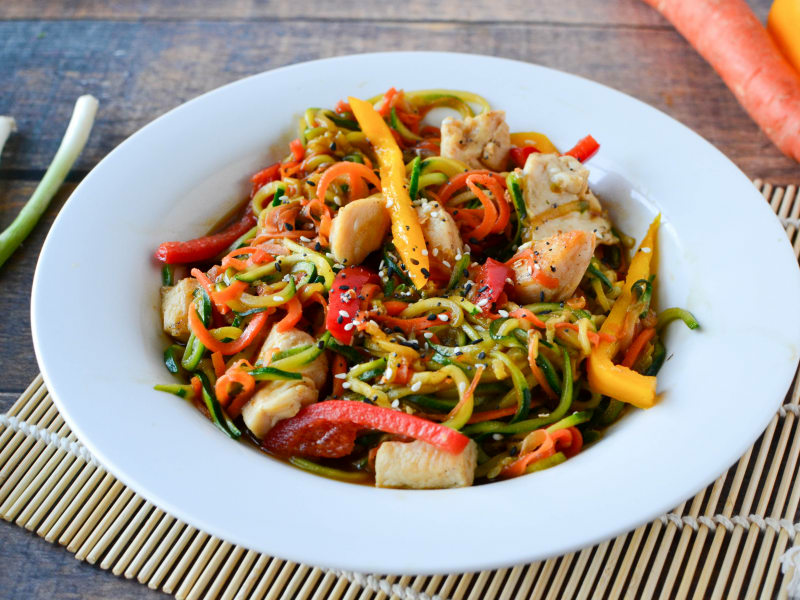 I tried this healthy spin on chicken chow mien and it was so delicious. I especially loved all the bell peppers mixed in. This is the perfect dinner and makes generous portions for two people. Really good chow mein with or without chicken. Sometimes I use steak. 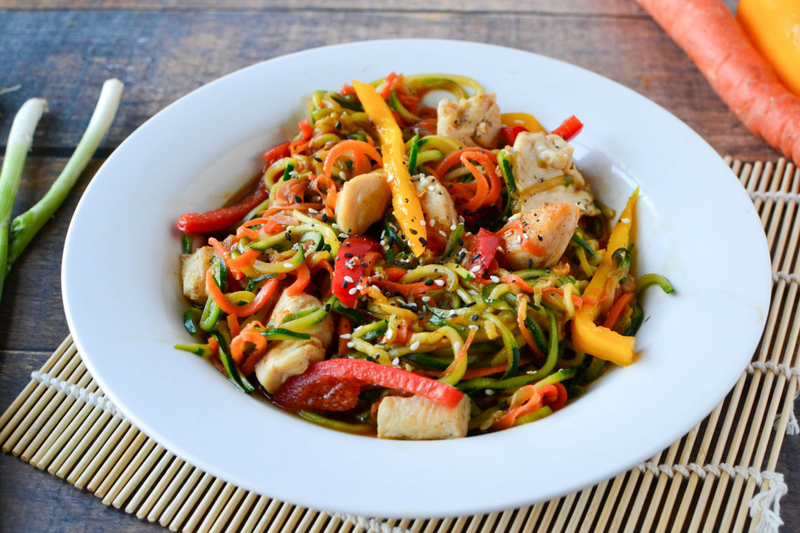 I really like this recipe because of the spiralized zucchinis. I don't even eat take out anymore! Thought this recipe was much better with chicken thighs, instead of breasts. The sauce was really delicious, but I used honey instead of agave and added extra soy sauce. This is great for those days when you want Chinese food but not all the carbs. I made this with chicken thighs instead. Really good recipe! I also used diced bell peppers instead of strips. I love getting takeout but its not always the healthiest option. I also added green onion on top for garnish.